As 2013 draws to a close, I have been highlighting my most popular pieces of the year as determined by readership. This one — #2 — gets “down and dirty” with big-time radio host Dave Ramsey’s investment advice. In short (and despite excellent advice from Ramsey in other areas), it’s dreadful. Not surprisingly, I got a lot of blowback (but also a surprising amount of support) from the Ramsey sycophants. Enjoy. Dave Ramsey has added further evidence to the pile already in place attesting to how bad we are generally at math and probability. Sadly, he’s no better than the mass of us. Let me hasten to emphasize up-front that Dave has done some fabulous work by helping many, many people to get out of debt, stay out of debt, budget effectively, live frugally and save aggressively. But when it comes to investing and to doing math, he is simply out of his depth. Let’s start with the backstory. Ramsey is an author, radio talk show host, television personality, and motivational speaker. Most prominently, Ramsey’s syndicated radio program is heard on more than 500 radio stations throughout the United States and Canada, as well as in podcast format and on SiriusXM satellite radio. As he tells it, his burgeoning real estate business failed on account of excess debt. But he was able to fix his problems and, along the way, learned a number of lessons about money and himself. Ramsey formed his company in 1992, in his words, “to counsel folks hurting from the results of financial stress.” That led to books, media and the rest of his overwhelming success. So far, so good. But there’s more. There are any number of problems with various aspects of the investment advice Dave offers. Ramsey has repeatedly suggested that investors should expect returns of 12 percent annually, adjusted for inflation and should be able safely to withdraw 8 percent annually during retirement to provide needed income. For example, page xv of his book, Total Money Makeover, claims that “I…dare to state that you should make 12 percent on your money over time” (more here) and bases that conclusion on historical returns for the S&P 500 (the S&P has averaged 11.82 percent return annually from 1926 through the end of 2012). Ramsey also recommends a portfolio without bonds. Those expectations and recommendations are unrealistic as well as dangerous, as many have shown (see here, for example). Moreover, Ramsey only recommends (specific) commission-based brokers he has partnered with and mutual fund A-shares, presumably because fiduciaries would be required to disclose that Ramsey receives payment from them for soliciting clients on their behalf. Ramsey has gotten a good deal of (mostly deserved) criticism recently from the financial planning community (see here and here, for example). I will focus today on the 12 percent claim. In response to the criticism, Dave invited Brian Stoffel, the author of a critical piece at The Motley Fool, to be a guest on his show yesterday to try to ameliorate the damage. Ramsey says that Stoffel, like The New York Times, simply doesn’t understand. 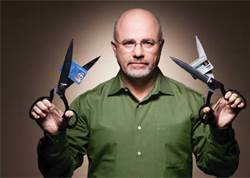 According to Dave, the crux of the problem is “financial nerds” who “analyze and ‘analize'” (the last word in the quoted section is rendered by Ramsey as “aay-nal-ize“) but “don’t do their homework.” Once again, Ramsey’s defense is that folks are simply out to get the “big dog” Dave Ramsey (“trashing someone with a bigger brand” as he said on the show yesterday). You can listen to this segment of the show here (the relevant portion begins about 10:30 in). Ramsey attacks Stoffel’s use of the 12 percent return assumption because his primary focus is how much people should save (Ramsey says at least 15 percent) and notes that if people had saved that amount over the long haul and invested in the growth-oriented mutual funds he recommends, they would have done quite well. But that, quite obviously, ducks the question. Those who saved and invested 15 percent of income over 20 years would indeed have helped themselves tremendously. But it doesn’t make the 12 percent claim accurate and doesn’t justify its use. It takes some understanding of basic math to understand why. Ramsey keeps emphasizing an average annual return of 12 percent, based upon the average annual return of 11.82 percent for the S&P 500 from 1926 through the end of 2012. That isn’t a reasonable expectation during a secular bear market, but that is beside the point. When Dave uses that number (as in the tweet shown above, where he plugs 12 percent into a 40-year savings plan of $100 per month purportedly to realize $1,176,000), he uses it as if it were an annualized return. The actual annualized return of the S&P 500 over that same period is not 12 percent or even 11.82 percent. It is 9.786 percent. And when we adjust for inflation, the actual number is roughly 6.61 percent. To his credit, as he promised on the show, Ramsey has now corrected his website such that a 12 percent return adjusted for inflation is no longer posited. But the real number is still 9.786 percent and that’s still a looooong ways from 12 percent. Instead of expecting $1,176,000 after 40 years, as Ramsey’s tweet suggests, a real life investor earning market returns would have roughly $600,000. That amount is nothing to sneeze at, surely, but to notice the difference between $600,000 and over $1.1 million is hardly the “hair-splitting” that Ramsey claims. Why the discrepancy? Market returns aren’t ongoing and consistent, which changes the mathematical results tremendously. For example (as Stoffel’s article points out), $1,000 invested in a year with 100 percent return will turn into $2,000. But a 50 percent loss the next year puts the investor back to square one — $1,000 — even though the average annual return over those two years is 25 percent. The average annual return is 25 percent but the annualized return is zero, zip, nada. During the broadcast, Ramsey claims that the 12 percent assumption was merely a “teaching illustration” and “an example to inspire people.” I suppose it’s possible that such was his intent. But when he uses that example (even to inspire people), he uses the numbers erroneously and to dangerous effect. (And, by the way, an 8 percent retirement withdrawal rate is crazy dangerous — so is a retirement portfolio 100 percent invested in equities — but beyond the scope of this article). On the show, Dave uses an example of an average American family earning $48,000 and saving $7,200 (15 percent) per year. With a 12 percent average annual return over 40 years, he says that they will have $7.4 million. However, the actual number is just under $6.2 million if the return were 12 percent annualized — already a $1.2 million difference. But using the more realistic and reasonable (because that is how the S&P actually performed) 9.786 percent annualized return, our average family would have roughly $3.6 million, only half of what Ramsey claimed. Again, that’s a healthy amount, surely (what’s a few million dollars amongst friends? ), and would be a boon to nearly everyone, but it’s nothing like what Dave claimed it to be. Ironically, Ramsey notes the “joke line” he uses when he makes this pitch: “If I’m freakin’ half wrong, you’re still okay.” And that’s almost precisely the amount of his error. So is any harm done, really? Dave seems to want to say that a $48,000 per year family retiring with $3.6 million isn’t bad at all. I get it. But not everybody hears “the message” early enough to do what he suggests. Let’s suppose our average family gets started late and only has — say — 15 years until retirement. They calculate that they will need roughly $600,000 saved to retire. They are very aggressive and begin saving $15,000 per year, more than double the standard Ramsey recommendation. Using a 12 percent annualized assumption, they expect to have accumulated over $625,000 in 15 years. Goal met! However, if they get standard historical market returns — 9.786 percent annualized — they will have accumulated over $100,000 less than that and be well short of their goal, requiring several more years of work (if the job and financial markets as well as their health allow). Perhaps a major market correction during that added work-time makes a lousy situation truly dreadful. Or perhaps, thinking all was well, the family doesn’t make timely adjustments to their plan (saving more perhaps) that might have allowed them to reach their goal on time. Dave’s 12 percent assumption really is dangerous after all. Of course, as listening to the show discloses, Dave doesn’t see his error (“It’s my show!”). “We’ll agree to disagree,” he insists But we’re not talking about a mere difference of opinion. We’re talking about error, plain and simple. Ramsey simply doesn’t get the math, protestations to the contrary notwithstanding. And his examples or illustrations or inspirational tales — whatever they are — are still significantly and demonstrably in error. One final point. Ramsey fears that criticism of him (“discrediting me”) will cause people not to save and that would be a dreadful thing. I agree that it would be dreadful if people didn’t save. I agree that it would be terrible if anyone concluded from this piece (as Dave fears) that Ramsey “is a deadbeat, stay away from him.” As I emphasize repeatedly, nearly everyone needs to save more — a lot more — and do so consistently. Nothing I write here should be construed as suggesting anything different. But instead of knocking those who would rightly and accurately hold Ramsey to account for the advice he offers, Dave (for the benefit of all of those who do, would or might pay attention to him) should simply get the math right. Doing a lot of things right shouldn’t shield anyone — even Dave Ramsey — from being accountable to the truth and good practice. It isn’t hard. It’s just math. This entry was posted in Best of 2013 by Bob Seawright. Bookmark the permalink.